1Why Do We Use Data Tables in the First Place? One of the most powerful features of Excel formulas is the ability to create absolute references that don’t move around when you drag to extend cell formulas or copy them to different places in your spreadsheet. Most Excel users figure out how to lock these references by either toggling through the options with the F4 key or using the $ (dollar sign) symbol in front of the column and/or row references. Why Do We Use Data Tables in the First Place? Data tables in Excel are useful specifically because they grow and change to accept new data when it is added to the table, without needing to update formulas or references. This is hugely valuable when you want to copy and paste data into a spreadsheet from an external source to keep it up-to-date. In a data table, you can create calculated columns that reference other parts of the data table. When new data is added, the calculated columns will automatically update with the new information and new rows! Summary formulas like SUMIF(), COUNTIF(), MAX(), MIN(), and AVERAGE() can be designed to reference the entire table or specific columns, and then automatically change to update their ranges when the tables grow or shrink! The flexibility of data tables makes them the first choice for working with structured information, so that just means we need to learn how to work with them! Keep reading to find out how! When you are working with data tables in Excel, the cell references look a bit different than the usual A1 letter-number combination for column-rows. This is because each row of the table acts like it is in its own 1-row spreadsheet. That means that the references only need to refer to the table name and the column. The row is assumed to be itself. Notice that it doesn’t ask for starting or ending row. It just asks for the column and table name. Without doing anything, the calculations accommodate extra data! No need to change references in the SUM() formula! Note that the final term – the criteria for the SUMIFS() – uses the @ (“at” symbol). This notation means you are referring to the value of the Region column in the current row. Just press ENTER to populate that formula in the entire column, and you can see the result of this reference in the completed table. The SUMIF() calculation sums all the Sales for each Region, giving a matching total for every row from the North region (and for each of the others as well). Now that you can see how powerful Excel data tables can be, you’ll probably want to use them… To build complex formulas quickly and reliably using data tables, you need to be able to lock references, so that’s what we’ll learn next… Click onward! Normally, it’s easy to build out columns and rows by locking references in formulas using F4 or adding dollar signs to the row and column of the reference… This lets you drag formulas down multiple rows or across multiple columns to quickly build a working spreadsheet. Here, we build a formula to calculate quarterly revenue based on volume and unit price. The volume will change each quarter in the new column, but the unit price will stay the same, so we lock the reference by pressing F4 or typing the dollar signs for $F$2 manually. Once the formula is entered, we click in the lower right corner to drag it across the columns for the other quarters. When we release the click, the formulas for each quarter are calculated. The cell reference for the volume cell (in blue) stays a “relative” reference that moves with the location of the formula cell. The reference for the unit price (in red), however, has become “absolute”, meaning it is locked to it’s original location. Unfortunately, using F4 or adding dollar signs doesn’t lock references in data tables. It doesn’t even calculate the cell, instead throwing an error. Fortunately, there is a way to achieve the same behavior, but it requires using Excel’s data table syntax we spoke about above. The easiest way to show how this is done is to walk through an example. Let’s combine the two sample data structures we’ve been working with to design a problem to solve in the next section. Click Next to continue! Let’s expand our Regional Sales table to a full 6 month period. This might be how your data could look if you were importing it from a database or other reporting software. It’s very machine-readable but not very human-readable. 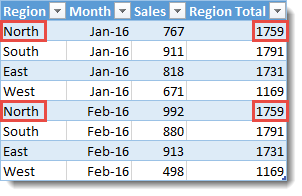 In this example, we are going to name the table in Excel as DataTable. Referring to an entire locked column in a data table. Referring to the current row of a locked column in a data table. Referring to the locked header row of a data table. 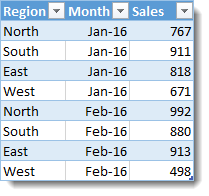 Working with Excel data table headers is a bit difficult because Excel treats them like fixed elements. That means it won’t remember that they are dates or other special types of data. They become field names. The assumption is that the number of columns in your data table won’t change over time – just the number of rows. After dragging the formula down and across your new PivotTable data table, you should see the equation change dynamically to populate the rest of the cells. Done correctly, the formula looks very much the same in each cell of the data table! The only thing that will change are references to the header row of the data table, since these are normal locking references for Excel cells. This is the final data table, complete with pivoted information. It’s much easier to read, and can be used to build charts and other reporting outputs as necessary. This process of adding ranges to all your data table references to make them absolute might be a hassle if you need to do it often… Fortunately, Jon Acampora over at Excel Campus has built an add-in that will map these locking ranges to the keyboard as F4 so they work just like normal absolute references in Excel. Hello Jeff! I have an issue with a formula where a cell need to be locked in a formula used to delete duplicates from column [Key]. The formula returns 1 for the duplicates (Except the first one found) and 0 for the non duplicates. What I would like to do is to replace the $I$11 with the named column [Key]. Which almost does the trick but not quite, because I can’t put 0 for the first duplicate found. Very good explanation. Exactly what I was looking for and the DataTable[[Header]:[Header]] solved my problem when filling formula to the right. Thank your for all this info! There’s a quicker way, if you drag-fill the formula and then choose ‘Fill without formatting’ from the dialog box, it keeps all the column references the same. i have a formula, =Ordersinhouse!H126, that fills in a cell, i want to fill in the cell with this data but want to block/lock keyboard entries in this cell, is this possible? Lock the cell containing the formula and protect the sheet. The fact that the cell is locked and the sheet is protected isn’t related to the formula not being calculated. I would suggest you to check that Calculation Mode is set to Automatic. It’s probably now set on Manual (In Office Ribbon >>> Formulas >>> Calculation Options). i have tried this, the problem still is that once i lock the formula will not fill in from the ordersinhouse page when data is entered on first page. i have made a short copy of the files i have done, is there a way i could send you a copy of the file so you could show me how to fix the issue i am not smart enough to fix on my own. Sure, I can take a look if you send me your file, just click on the hyperlink of my name and send it through the email you find in my website. Please add the summary of the problem to the body of the email when sending the file to me.